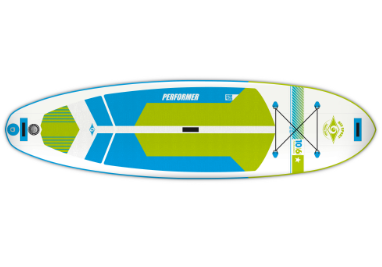 The Allround series delivers on all the benefits of our unique SUP AIR construction technology in shapes that excel in a wide variety of conditions, from flat water cruising to surfing in ocean waves. The 10’ works great for novice riders up to 175lbs. Allround boards come standard with nose and tail carry handle, O-ring leash attachment point, universally compatible center fin box and premium diamond-groove EVA deck pads. The 10’ includes bungee deck rigging for storing gear. Max Ride weight for good stability – 175 lbs.